Austin Maitland is a graduate student in urban planning at Rutgers University. Today he shares a guest article about three vital lessons we can learn from a small town in New York. After decades of suburbanization, many Americans are left wondering, "Where did our towns go?” Main Street is a hollow shell of its past and the mall that killed it is one anchor store away from irrelevance. Sidewalks sit empty while more and more cars clog the roads. In need of solutions, residents and planners often look to the vibrant cities of Europe or expensive urban areas of the U.S. However, it’s easy to forget that more practical examples of great communities exist far away from San Francisco or Copenhagen. This brings us to Millbrook, New York. 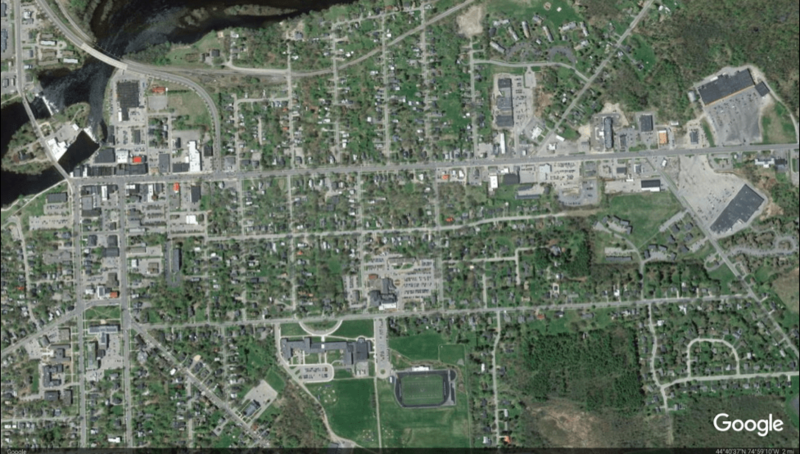 The original main street (left) takes a back seat to sterile, expensive, auto-oriented strip development on the outskirts of town (right). 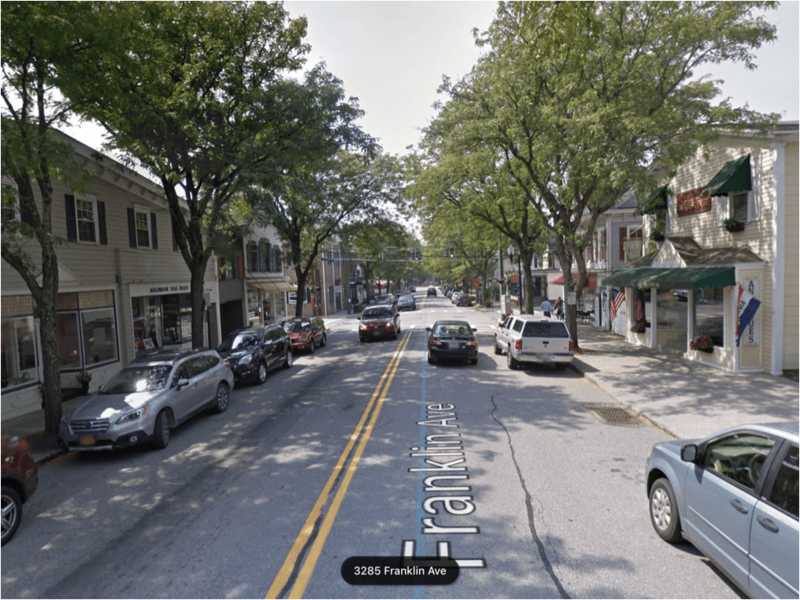 Millbrook has avoided such development and its main street, Franklin Avenue, still serves as the primary commercial corridor. The village of Millbrook takes a traditional form with residential neighborhoods surrounding a mixed-use core (center). Without pressure from peripheral strip development, Millbrook’s village center thrives. Franklin Avenue is lined with an impressive variety of shops, cafes and civic buildings. This integration of commercial activity with the surrounding village neighborhoods invites residents and visitors to enjoy the town on foot rather than by car. Despite the lack of any substantial off-street parking, the sidewalks are alive and well with full storefronts and a steady stream of foot traffic. Unlike most commercial corridors, Millbrook embraces the kind of human-scale development often prohibited by local zoning in spite of nearly ubiquitous demand. A variety of building types and shops line Franklin Avenue. Diners enjoy one of many outdoor cafe seating areas lining Franklin Avenue. 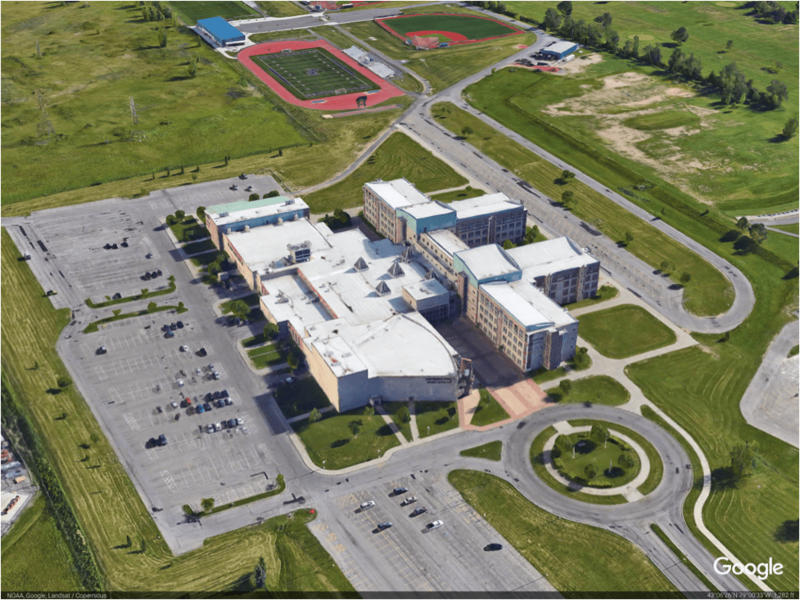 Schools that once filled stately buildings in prominent locations near the center of town have transformed into sprawling, isolated campuses far from any meaningful civic life. Trees and berms heavily buffer the site from surrounding developments (if any exist) and parking lots generously pad the building on all sides. All of this ensures a complete lack of engagement with nearby streets, often necessitated by proximity to dangerous state highways. Schools have slowly transitioned from bustling anchors of neighborhood activity to just another curb-cut along the road. Millbrook has taken a different approach. 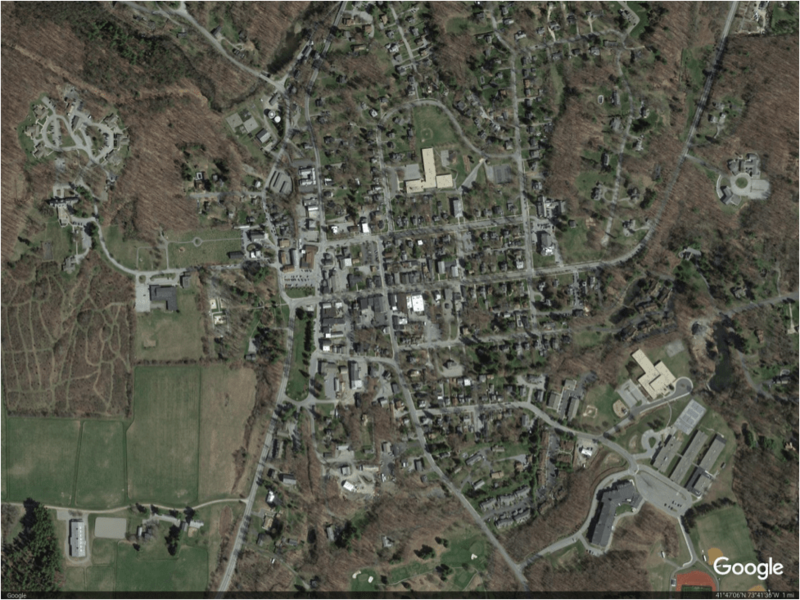 All of Millbrook’s four school buildings are located within a half mile (10-minute walk) of the center of town. For instance, Elm Drive Elementary School is surrounded by residences on all sides. The proximity of housing not only encourages children, parents and staff to walk to school; it adds eyes on the street, a welcome layer of security that does not exist at the educational fortresses pervading the suburbs. In addition, high schools located near the center of a community remove the need and temptation for newly licensed teenagers to drive to school, making streets safer for everyone. The treatment of schools as an integral community asset rather than a nuisance to be contained is an important step towards a stronger neighborhood. Elm Drive Elementary School (above) is located in the heart of the village. Its central location adds to the walkability of the neighborhood and reinforces a sense of community. The remaining schools are located a short walk from the village (below). When it comes to building a vibrant community, Millbrook demonstrates that the number of people in any given town is of relatively little importance. In fact, many towns with dramatically higher populations than Millbrook come nowhere close to matching Millbrook’s level of street-level engagement and activity. The fundamental difference is not population but pattern of development. For decades, local governments of all sizes have used zoning to force land uses apart and consequently enshrine the private automobile as the sole mode of transportation between any two destinations. Millbrook proves there is a different way to approach development and that your town doesn’t need the density of London to support great neighborhoods, free from car-dependence. With the proliferation of form-based codes and rejection of parking minimums gaining steam, it’s clear there is demand for change. Towns seeking to become economically resilient and differentiate themselves as more than another series of congested strip malls and subdivisions can look to Millbrook as a model. While Millbrook highlights the importance of mixed-use zoning and engaging with community assets, it also serves as a powerful reminder that great communities come in all sizes. Every town has the ability to counter the tradition of suburban development and embrace a new era of building great communities. In this episode of our podcast It’s the Little Things, Jacob chats with Darren Smith—Founder, President, and CEO of Traipse—about how you can boost your historic business district with gamification, including how to gamification can boost tourism, get more traffic for merchants, and make your historic business district the destination it deserves to be. 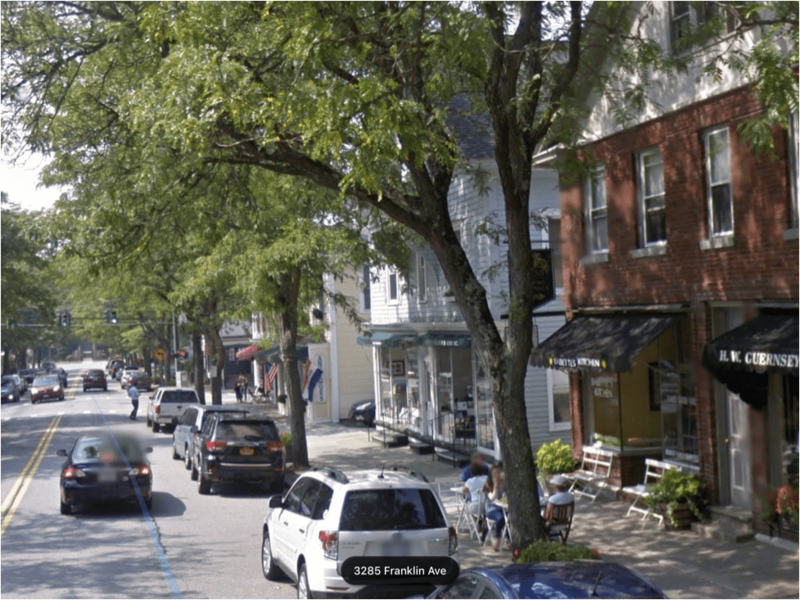 A narrow main street demonstrates just how powerful small changes in street design can be.